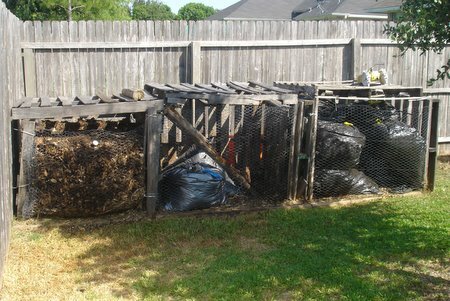 The TCEQ (Texas Commisson on Environmental Quality) sponsors a Master Composter program similar to the Master Gardener program. In March of 2006 I completed a course sponsored by the BVSWMA as part of becoming certified as a Master Composter. The certification process also includes a number of hours teaching and demonstrating composting clinics. If you are in the Brazos Valley, I highly recommend the Master Composter classes offered by the BVSWMA. You’ll receive classroom training, Rodale’s book, hands-on ‘lab’ training and a bin to get you started, all for $15. If you are outside the Brazos Valley, check with your local city or county agencies to find out if a similar program is available. Unfortunately, BVSWMA no longer conducts these courses. My interest in composting was fueled by several things: my growing interest in sustainable agricultural systems, my concern about and desire to ‘opt-out’ of our materialistic/consumption driven culture in the United States, my desire to grow lots of vegetables, among others. I also see the great benefit in the time I can spend outdoors working in support of the way God has created nature, instead of working against it with systems devised by man. There are great resources all over the Internet and in your local library and bookstore. The best resource I’ve found is the book below. You’ll find most of the same information out on the web, but this book is the de facto standard; there’s nothing I’ve found it lacking. It’s the best $10 you can spend for learning about composting (unless your city has composting classes). You can make a compost bin out of a variety of materials. The only factors are how much you want to spend and your aesthetic tastes. I started with a single bin made from shipping pallets (free), some screws, a couple of door hinges, and chicken wire ($10) and progressed to three bins made of the same materials. You can see photos below. There are some items that will make your composting much easier. A pitchfork is a must and, while not necessary, a thermometer can really help you diagnose any problems when you are just beginning (and provides some excitement when you first ‘make temp’). I purchased my thermometer through the BVSWMA for $15. I’ve listed the model and manufacturer below, but you can find comparable models and prices on the web as well as at local garden stores. If you’d like to learn more about composting, I’d be happy to teach you what I know. I have conducted several ‘classes’ on composting and would be happy to help you, your family, or group get started. If you are interested, contact me.